Take everything to the game in our TRI-COLOR BALL BACKPACK, a 600-denier polyester soccer backpack with PVC coating for durability. 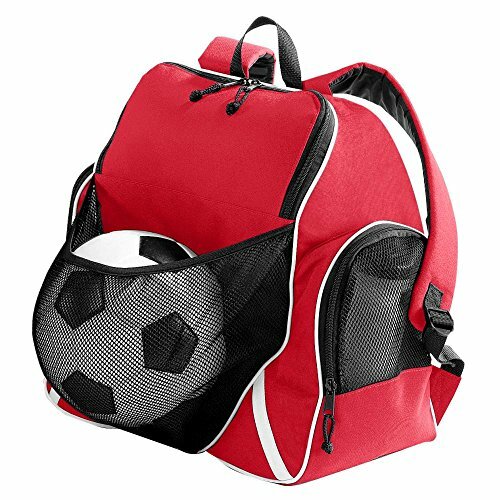 Features a main compartment with two zipper pulls, a zippered inside pocket, plastic key holder, black mesh zippered pockets on each side, and front black mesh pleated pocket with elastic binding large enough to hold a soccer ball. Doubling as a tennis bag, this pack has one angled white stripe on front sides and a contrasting white piping trim. Also includes a black web handle at top with reinforced stress points, a padded back for support and comfort and adjustable padded shoulder straps.